Malawi’s population, just four million at independence in 1964, will increase from 18-million today to 26-million by 2030, increasing the pressure on already scarce resources. The answer: Increase diversification to create jobs, improve the enabling environment for business to invest, and increase access to markets. But how? Two answers stand out. By OLUSEGUN OBASANJO, DICKIE DAVIS and GREG MILLS. “Before IPS,” says Francis Simion, 39, a Malawian farmer in the village of Njovuyalema, “I had just half the production I have today.” He was referring to the Integrated Production System of the Limbe Leaf tobacco company, from which he receives seed, fertiliser and technical advice in exchange for directly contracting his produce to the company. This system has changed his life. His five hectares of maize and four of burley tobacco now bring in more than $10,000 annually. In the seven years he has been on the programme he has been able to build himself a brick home with a corrugated iron roof, buy goats, 18 head of cattle, chickens, and a five tonne truck which he uses to move the local produce, measured in “oxcart units”, to market. He owns one of 30 cellphones among the 56 families in the village of Njovuyalema (literally, “The elephant is tired”), an hour’s drive north of Lilongwe. The comparison with those not on the IPS system is stark. We found Charles Layimon and his family amid the dust of nearby Mankohokwe village, sitting cross-legged on a reed mat stripping corn from cobs. Farming three hectares of mostly maize, “with a little bit of tobacco” since he did not have the required 10c per kg of tobacco crop required to register as a producer with the government, this crop had to be sold on the side, earning him, on a good day, perhaps a quarter of the going rate. He showed us into his sparsely thatched mud hut nearby, two tiny, dark rooms, one with a wood fire on the floor, the other where he, his wife and two children slept. Looking much older than his claimed 42 years, his was the harsh face of hopeless poverty. He owned no livestock, could not afford the $40 to buy a bicycle and stood little prospect of ever affording the $40 per term required to send his children to a state secondary school. Two Malawians, two stories, two different trajectories. This situation is replicated in other villages, in other sectors, across the whole country and, indeed, the region. Those farmers in contractual relationships with big firms are prospering, at least by Malawian standards, and those left to fend for themselves are struggling. The IPS is also working for farmers in neighbouring Mozambique. Led by Limbe’s sister company, Mozambique Leaf Tobacco, the province of Tete has experienced a tobacco revolution over the past 15 years, positively affecting the lives of 60,000 farmers, 40,000 contract labourers and their estimated 700,000 dependants. New tin-roofed houses and full maize storage nkhokwe, in the village of Nhkame along a donga-ridden road 300kms north-east of Tete, tell a similar story of recent prosperity. In both Malawi and Mozambique the farmers benefit from digital technology. They are regularly visited by one of the “leaf technicians” on their motorbikes who both offer advice and keep detailed records on their solar-charged tablets. The bales of tobacco are bar coded, enabling traceability from the farm through the buying centres and factory to the customer. The global economy works, for those who have access. But the chances of improved access in the current environment are slim. While Malawi is the largest producer of burley tobacco in the world, global demand sits pegged at 600,000 tonnes. Mozambique provides another 70,000 tonnes. Anti-smoking campaigns have slowed tobacco growth and may, in the longer term, even reverse it. 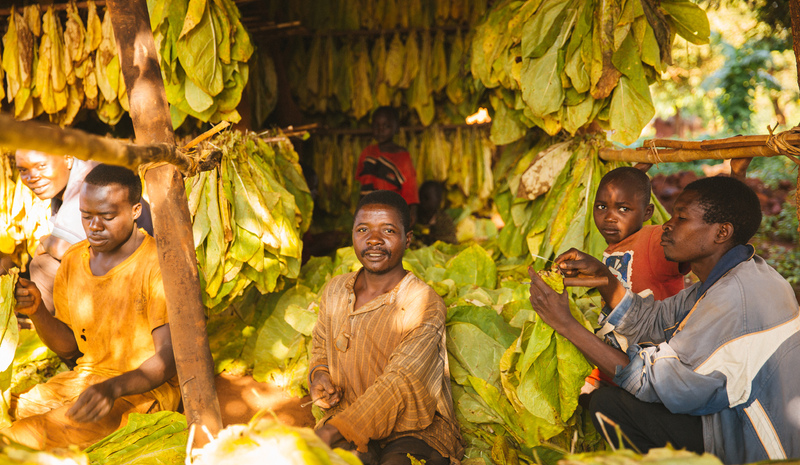 Still, tobacco makes up nearly two-thirds of Malawi’s export income, earning $435-million in 2015. Sugar cane, just under $100-million, provides much of the rest. Fresh economic opportunities in Malawi are few and far between. The country averages $150-million annually in foreign direct investment. This is in part because it’s a difficult place to do business, ranking 141st out of 189 on the World Bank’s Ease of Doing Business index. Governance is weak and blighted by corruption. This explains why the donors are the biggest players in town, averaging $1.1-billion in annual inflows since 2010, accounting for nearly 20% of the economy. If the prospects are scant, the challenges are increasing. Malawi’s population, just four million at independence in 1964, will increase from 18-million today to 26-million by 2030 according to the government’s own projections, increasing the pressure on already scarce resources. The answer to such challenges in Africa, as elsewhere, is usually given as: Increase diversification to create jobs, improve the enabling environment for business to invest, and increase access to markets. But the more difficult question is: How? The first lies in improving price stability and predictability in other crops, notably maize. As a staple, it’s a favourite target of government intervention to manage prices and stocks. But this is rarely done with consistency, and year-round. As a result, speculators abound, buying early and cheaply, and selling late and with considerable profit, all at the expense of the farmer. The maize price in Malawi has depressed, as a consequence, from 170 Kwacha ($0.50) per kilo last year to 60 Kwacha today. Despite a good harvest, an ongoing maize export ban is also serving to keep prices low, given the lack of market alternatives. A second is in increasing diversification. This requires, in turn, three fundamental and related actions: Revitalising the tourist sector, improving and reducing the cost of access by air and land to markets, and electrification. The country currently survives on 290 MW of installed electricity capacity. Without a considerable uplift in power generation and distribution capacity, further value addition to commodities is improbable. And absent these changes, the prospects for altering a vicious cycle of poor education, nigh zero employment prospects, lack of healthcare, poor nutrition and low income are slim. Of course there are other, necessary actions, including finding the means to expand the quantity of agricultural land under irrigation and in improving the access of the poorest to education. But this is slower burn stuff; ending mispricing and ensuring price stability increasing production and income can happen quickly. In the village of Chidoti, Mrs Levison sat forlornly, staring out of the doorway of her tiny dwelling measuring little more than 2 metres square. Outside baking in the winter sun were her mud bricks. She complained, like all of the villagers we met, that she never saw government, though she “just wants inputs” to get her business going. President Obasanjo, Major-General (rtd) Davis and Dr Mills are with the Brenthurst Foundation, and launched Making Africa Work: A Handbook for Economic Success in Malawi this week.